If you find someone in an economic development office who suggests theirs is a bad community to invest in, you’ve probably stumbled upon an incredibly honest soul, not to mention an employee who might want to dust off their resumé. Most municipal staff in Ontario believe, for one reason or another, that their town is the best place to live, work and spend money. But when the folks in Kitchener and Cambridge say it, they’re not alone. According to the Real Estate Investment Network’s (REIN) 2014 Top Ontario Investment Towns report, Kitchener and Cambridge are tied atop the list of the province’s best places for real estate investment, with Hamilton nipping at their heels. REIN’s 2014 report cites almost the exact same list of 12 cities and towns as the 2012 edition, with only Milton being added to the roster and Brantford deleted. Even the ranking of that dazzling dozen is fairly similar, with Kitchener/Cambridge flip-flopping with Hamilton to take over top spot. Is the area’s population and average income growing faster than the provincial average? Is new infrastructures being built to handle that growth? Is the area creating new jobs and taking steps to maintain current employment levels? Is political leadership creating an economic growth atmosphere and are major transportation improvements in the works? Will it benefit from an economic or real estate ripple effect? Does it have more than one major employer? Is it attractive to Baby Boomers’ lifestyle? Is there a short-term problem occurring that is slated to disappear in the future? Is there a noted increase in labour and materials cost in the area? The communities listed in REIN’s report are ranked according to their long-term investment potential, not short-term speculative market runs. Several sources are consulted, including Canadian Mortgage and Housing Corporation (CMHC), Multiple Listing Service (MLS), Statistics Canada, regional real estate boards and local economic development offices, among other individual experts (the entire report is available for download at topontariotowns.com). Campbell sees Vaughan as another place with huge potential. Although the six-stop subway extension from Downsview Station to the Vaughan Metropolitan Centre (currently in development) has seen multiple delays and may not be complete until the beginning of 2017, its connection to nearby York University and the GTA will be a huge boost for Vaughan residents and businesses. “We have a diversified and entrepreneurial economy that adjusts quickly to changing market conditions,” says Kitchener’s Economic Development executive director Rod Regier. “Our businesses are often at the cutting edge of technology and the startup ecosystem supported by our universities and colleges, Communitech and the Accelerator Centre continually invent and capture new economic opportunities. As a result, highly innovative companies ranging from startups like Vidyard, Thalmic Labs and Clearpath Robotics, to global giants like Google and Electronic Arts are flourishing in our city. Cambridge, meanwhile, highlights its excellent parks, trails and recreation facilities and location along the Grand River as keys to its continued growth, augmented by a thriving arts and culture scene and excellent school systems. The city has also been streamlining the way in which it handles development applications, while nurturing existing businesses. New arrivals include Heroux Devtek, an aerospace manufacturing company that will begin manufacturing the landing gear for Boeing 777 aircraft this year. recently completed a master environ-mental servicing and community plan for a 300-hectare area in the north of the city on the Waterloo border known as the East Side lands. Why build new homes in Hamilton? “Because of available employment lines, affordable development costs and an open-for-business staff and council,” says Michael Marini, marketing coordinator for the City of Hamilton’s Economic Development Office. Barrie’s population has grown from just 45,000 in the 1980s to approximately 143,000 today, with a projected population of 210,000 by the year 2031, making it one of Canada’s fastest-growing metropolitan areas. 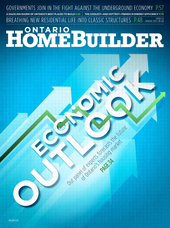 What makes Barrie further attractive to home builders? Available competitively priced land, for one. Although many believe that most of Barrie’s land has been developed, provincial growth targets, a push for intensification and the preparation for development of 5,770 acres annexed in 2010 from Innisfil should mean ample building opportunities for years to come. A high level of immigration and constant influx of students to some of Canada’s top post-secondary institutions—University of Waterloo, Wilfrid Laurier University, Conestoga College, as well as think tanks like Perimeter Institute, Centre for International Governance Innovation and Institute of Quantum Computing—continue to drive strong economic sectors and a high quality of life. Other factors to consider are its growing technology, financial and manufacturing sectors (Waterloo is home to many Canadian and international headquarters such as Manulife Financial, Sun Life Financial, OpenText, SAP and BlackBerry), as well as great access to transportation amenities, including an approved LRT system and proposed all-day two-way GO service with Toronto. Touting its extensive trail systems and active park spaces, the city plans to continue its high-quality urban intensification in its uptown core, while adding new park space, office spaces and a broad range of housing. of 4.2% (or 18,000 new residents) per annum. Further, of the cities and towns located within 40 kms of Pearson International Airport, Brampton has the largest inventory of designated vacant residential and employment land for new construction. It’s also home to the largest intermodal railway terminal in Canada and has immediate access to an extensive network of trans-continental highways. “The home building sector is strong in Brampton as a result of population growth and the high-quality lifestyle amenities the city offers,” says Nancy Johnston, manager of business development and marketing for Brampton’s Economic Development Office. Those amenities include 850 parks, 217 kms of city-owned trails, several recreation centres, the state-of-the-art Brampton Civic Hospital and the Peel Memorial Centre for Integrated Health and Wellness (currently under development), an internationally recognized Fire and Emergency Services team, a growing arts and culture scene, two major shopping facilities, as well as a designation as an International Safe Community by the World Health Organization. A new university is also in the planning. “For investors who are willing to do a little homework and pick their neighbourhoods carefully, Brampton can provide solid positive returns for years to come,” cites the REIN report. “Unlike other cities that rely on a small number of industries or sectors, Ottawa’s diversity allows it to weather an economic storm better than most,” advises the REIN report. The downside for home builders is that numerous research and development centres, government institutions and post-secondary education facilities provide the city with a steady flow of quality renters, as opposed to those looking to make Ottawa their permanent residence. Still, “according to the economic fundamentals, Ottawa should provide homebuyers and real estate investors with solid returns on their investments over the coming years,” says the report. “Transitioning from a suburban municipality into a fully metropolitan community, Vaughan offers some of the lowest commercial and industrial taxes in the GTA,” indicates the report. Having already experienced tremendous growth in the past decade, once all the region’s transportation projects are completed—including the subway extension, as well as the extension of Highway 427 north to Major Mackenzie Drive—Vaughan will be among the most accessible regions in Ontario. Due to population targets set by the province and servicing allocations from York Region, Vaughan’s estimated population of 314,117 is expected to grow to 416,600 by 2031, with a multicultural blend of families continuing to be attracted by the area’s welcoming environment (46% of the population is foreign-born and residents speak 99 different languages). The Mackenzie Vaughan Hospital is set to open its doors in 2019, and the new Vaughan Metropolitan Centre mega-project will anchor the city’s future downtown, as well as being home to 25,000 residents living in a diverse housing mix. Including the towns of Ajax, Brock, Clarington, Oshawa, Pickering, Scugog, Uxbridge and Whitby, Durham counts 18 interchanges to Highway 401 and 62 GO trains travelling every 30 minutes to downtown Toronto each day. “The region has experienced a ripple effect from Toronto as people move east of the metropolis in search of more affordable homes,” observes the REIN report. With one of the fastest-growing populations in Canada, forecast to go from its current 650,000 to nearly one million people by 2031, “the Durham Region has come to be known as an ‘emerging power’ within the GTA.” To accommodate that anticipated growth, the housing supply is expected to increase by 83.%, says Kathy Weiss, Durham’s director of Economic Development and Tourism. From an infrastructure standpoint, more than $2 billion in projects have been recently completed in Durham, including the Automotive Centre of Excellence, GO Bus maintenance facility, the Energy Systems and Nuclear Science Research Centre, the Durham College Whitby Campus Expansion and the Ontario Power Generation Darlington Energy Complex. There was an additional $1 billion of private capital investment in 2013, and another $3 billion in public projects are currently underway, including phase one of the Hwy 407 extension. In the battle for Canada’s fastest-growing city, all other municipalities bow to Milton. Registering a current population of approximately 103,000, the number of residents is expected to skyrocket to approximately 228,000 by 2031. Milton’s last major census (2011) revealed that 73% of residents have post-secondary educations, that the median age of 34.1 was one of the youngest in Canada, that average family income was $114,495, and that the labour force—47,200 in 2011—was expected to grow to 81,106 by 2021. Other attractive numbers include residential construction value ($105.6 million in 2013) and the fact that it boasts amongst the lowest residential and business property tax rates in the GTA. Centrally located on Highway 401 and near Highways 407, 403/QEW, 410, 427 and 400, Milton also has direct CN and CP rail access, commuter rail (GO Transit) links to downtown Toronto and quick access to Toronto Pearson International Airport. Some caution was expressed, however, by a recent report on Milton’s future employment growth, which observed that additional lands will be required to support anticipated population growth. At the crossroads of Highways 11 and 12, and nestled between Lakes Simcoe and Couchiching, Orillia’s waterfront playground is a big lifestyle lure. But its new 150-acre West Orillia Employment Park and Lakehead University’s construction of a $45-million regional campus feed the area’s growing momentum. Excellent healthcare at Soldiers’ Memorial Hospital, which recently underwent an $83-million redevelopment and expansion project, its location as headquarters for the OPP, and the nearby Casino Rama, the province’s most successful commercial casino, are also attractive commodities for many potential residents.